Miso Crafty Knits: Say it's your birthday! Birthday tiara courtesy of my dear friend Leana. Thanks Miss Dee! 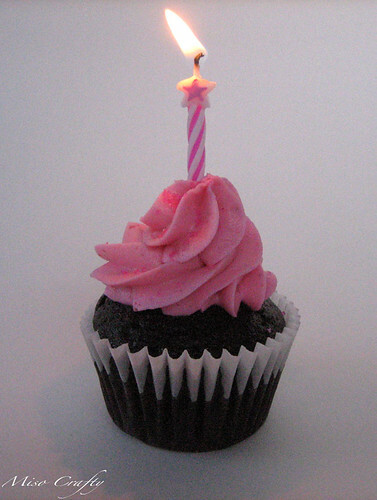 It was my birthday on Sunday (hence why there was no blogging all weekend!) and rather than having a big shin dig and whatnot to ring in my "dirty thirties", I decided something simple and more low-key is what I wanted. It all started Saturday night, when Brett made me a magnificent dinner (sorry, I didn't take photos cause I was extremely hungry and forgot to!) 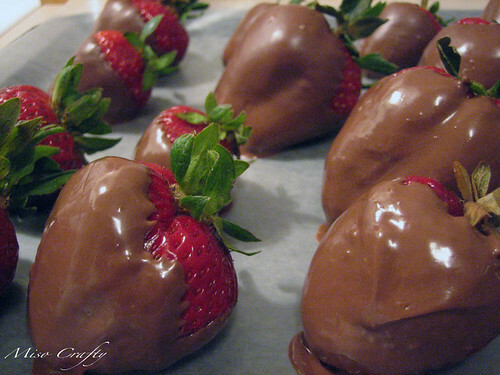 and then proceeded to make me some chocolate-dipped organic strawberries!! Yes, I scored me a keeper! I don't know who had more fun - me, cause I got to eat the strawberries, or Brett cause he got to lick the bowl the melted chocolate was in. I thought it was just going to be regular milk chocolate, but Brett didn't stop there. 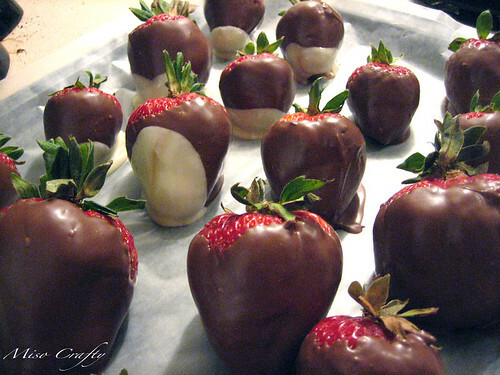 Oh no, he also dipped those bad boys into some white chocolate too! They were oh so yummy and oh so decadent! 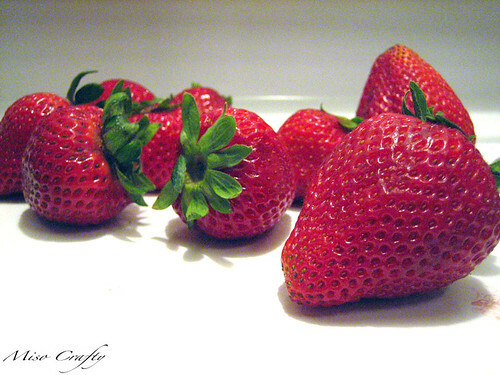 The strawberries alone were so nice and perfectly sweet, but to add 2 types of chocolate?? BINGO! I was in heaven!! The next day we went to Ooh La La Cupcakes but unfortunately they weren't open. 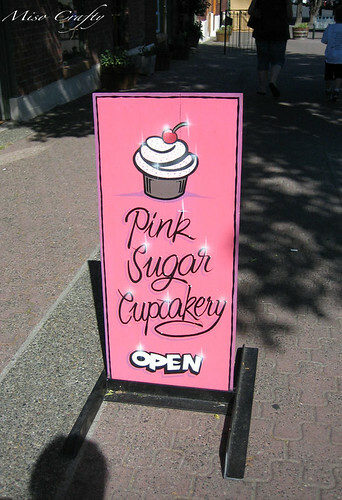 So we continued on and headed over to Pink Sugar Cupcakery (their Fort Street location is about to open soon!) and picked up some yummy treats. 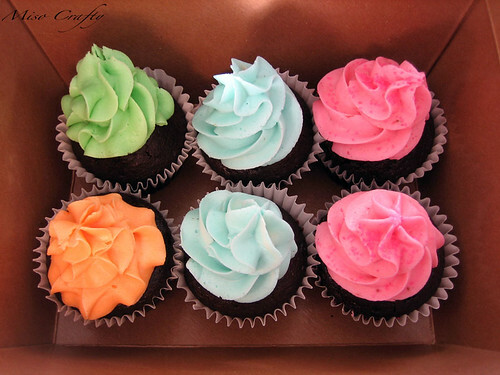 I had wanted to get cupcakes from both bakeries, since I've never been to either and wanted to sample their goods. The former is your typical cupcake while the latter is a dairy- and egg-free version of the yummy treat! I had completely forgot about this, and so when I took my first bite into one of the cupcakes I couldn't figure out why it was so...different. But not in a bad way. I was just expecting pure sweetness and a sugar rush. 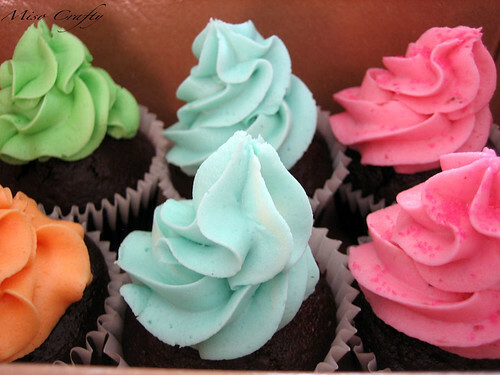 These cupcakes were quite moist but not too sweet. They kind of remind me of the Starbucks vegan brownies, which I absolutely love. And no, I'm not a vegan. But those things are so damn tasty! 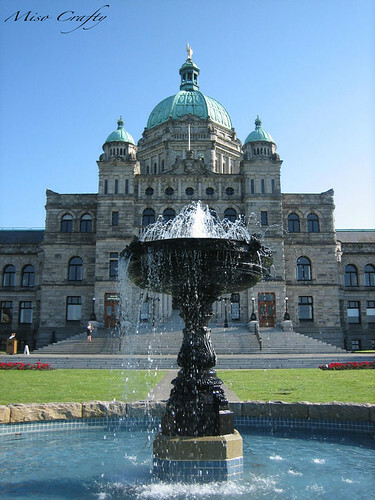 The little family and I went for a lovely drive all around Victoria, since it was such a gorgeous day out. Then we packed a picnic lunch and went over to the Parliament building to sit on the lush lawn and enjoy the sun, view, and people watching. I had originally wanted to go to the beach, but then remembered that the little one likes to think of everything as food. The thought of him shoving sand into his mouth made me cringe and nix the idea. Then I thought about the park, but it was getting a little late, so Parliament building it was. I'm glad that we went to the Parliament building, not only was it so open, but we got to see so much. As busy as it was around us, it still remained to be peaceful somehow. I loved watching the little one try to figure out what grass was all about, and how he would gently touch it to see how it feels. 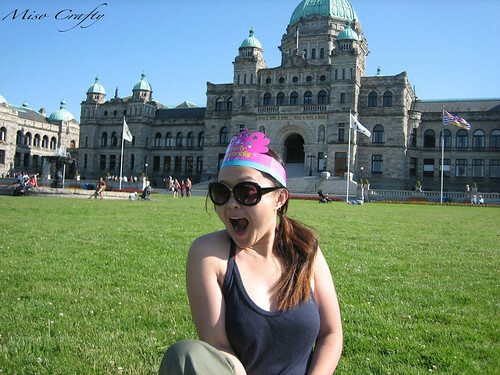 If someone were to tell me a few years ago that I would be celebrating my 30th birthday in Victoria with my family having a picnic, I would have laughed in their face. I would've screamed, "bring on the booze and put on our dancing shoes!". And yet, I'm not in the least bit sad/upset that I didn't have a huge party or affair of sorts. I think this is because next year I plan on celebrating turning 25...again. I'll admit I was a tiny bit sad that I couldn't have my friends there enjoying the picnic with us, but I know I'll be seeing them in Vancouver next month anyways. 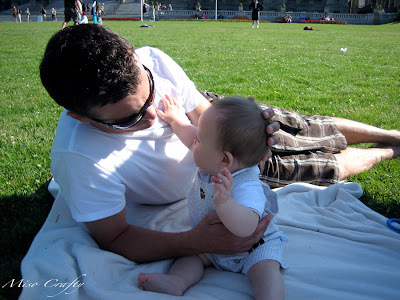 After the picnic Brett took care of the munchkin while I got to sew for a bit. But that was quickly put to an end when the little one demanded my attention. That was ok though, cause while I was putting him to bed Brett made yet another delicious dinner for me of all my favorite foods. Again, I didn't take any photos cause I was overly famished and had gobbled up the meal before I even remembered to grab my camera. I felt bad that Brett slaved over the dinner to make up for the fact that his present had yet to arrive. Yes, Brett bought me a present that he had to order from California to get. He won't divulge any hints as to what it is, all he would say is that it's suppose to arrive by the end of the week. The suspense is driving me crazy!!! And Brett is sooo good at keeping secrets, that he has yet to let anything slip! I have a feeling that the rest of the week is going to be torture for me! But hey, at least I had a very good birthday! Happy Belated Birthday! Glad you had a good one and those cupcakes look divine! Where is the store? I need to go there. My bday is on Sat...yuck, I am so not loving the 30's! Thanks Shannon! The store is in a weird location...well, to me at least. It on Gladstone Avenue in Fernwood. It's not on a street, but on a walking only area. It's on the corner of Gladstone Ave and Fernwood Road, across the street from the Fernwood Inn Pub...in this obscure yellow building where there appears to be a bunch of little shops. I should warn you though, from Brett's comment when he got them...they are a little pricey. He didn't let me go into the shop with him, but from what I gather it was almost $20 for 6 cupcakes? Happy early birthday!! Are you turning 30 as well? Or are you already there? Everyone keeps saying that 30 is the new 20s...I'm not seeing that yet!